Mean games. Games where you crush the other players' plans, hopes, dreams and egos. Games that make players cry. Some people love 'em, some people can't stand 'em, but everyone seems to agree that some games are just plain mean. What is it about a game that makes it mean? Why are some games mean and others not so much? This was one of the first episodes we recorded, and it's still one of my favourites. We hadn't quite figured out our sound arrangement at the time, so the audio's a bit janky, but we hope that won't get in the way of your enjoyment. Week four of 20th-Century Classics month! We bring our month of nostalgia to a close with one of the biggest nostalgia games out there. Many customers at Snakes tend to balk at playing games that have a plot, but they don't seem to mind this one. So where did this game come from? How did it take the form we know today? What life lessons does it have to teach? What can we learn about life... from Life? Week three of 20th-Century Classics month! It's been said that a mystery endures far longer than an answer. This certainly seems to be the case with Clue, one of the most enduring games of the 20th Century. Whodunnit? Where? And how? The answer is always different, and the world has not yet tired of solving the mystery. Why is Clue still so popular? What was the secret to its success? Does it deserve its reputation as a classic? And what other games might appeal to mystery fans? Week two of 20th-Century Classics month! Here's a game most people seem to either love or hate. Just mentioning Risk conjures up images of broken friendships and flipped tables. But why does it get such a powerful response, good or bad? How has it stood the test of time? And what's the deal with all those alternate versions? Week one of 20th-Century Classics month! Board games grew into the form we know and love today during their formative years in the previous century. Some games from that era have endured and are played by millions the world over to this day. This month we'll take a look at some of the most famous of them all from the perspective of the game gurus. First up: Monopoly! Games mentioned: Monopoly, Hey! That's My Fish!, Quarto, Nowhere to Go, Hive, I'm the Boss! Some games have big themes, and few are bigger than the building of an entire civilization. These games give you the chance to lead your people to greatness through exploration, culture, discovery and conquest, but they can be intimidating for the uninitiated. Have a listen and see if this venerable genre might hold some appeal for you. So you've played Cards Against Humanity. What next? 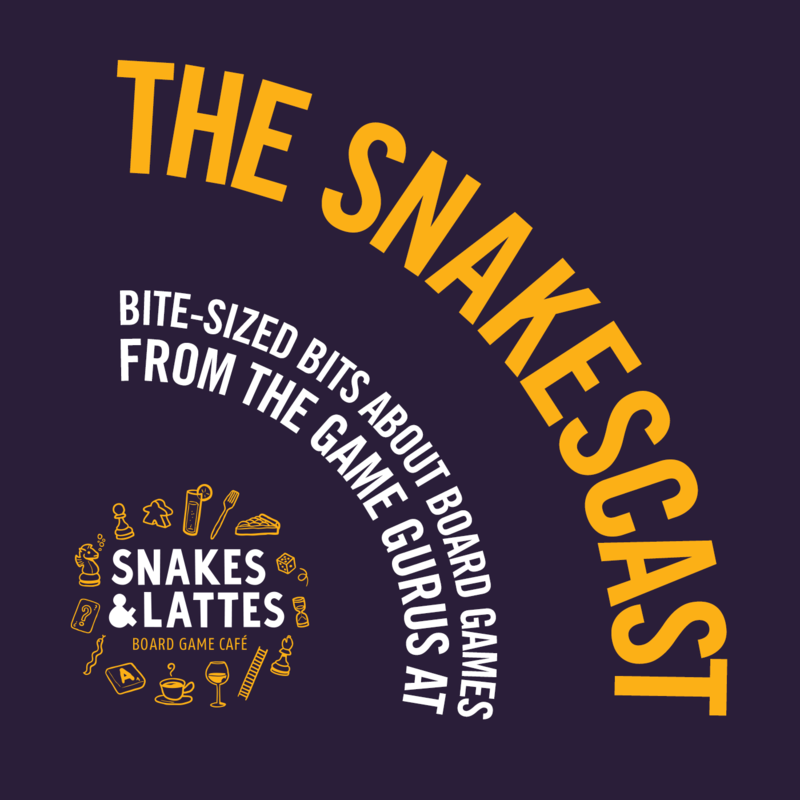 LISTENER DISCRETION ADVISED "Cards Against Humanity" might just be a random collection of cards with weird and offensive things printed on them, but it's also the most popular game at Snakes & Lattes. Longevity isn't exactly its strong suit, though. So how can you keep it interesting after you've played a few times? What are European-style strategy games and why should you care? If you're new to the hobby, it may surprise you to discover that there are different schools of thought in game design. Let us introduce you to the European style of games, and see what you think. So you want a party game but you've only got two players? A lot of our customers love party games and ask to play them often, but sometimes they only bring one friend with them. Which puts us in a tough spot, seeing as how party games are, well, party games. As in, they don't work unless you've got a big group. So what do we do then? Come in to Snakes & Lattes any day of the week, and you'll see grown men and women having a great time playing games that were designed for small children. What is it about kids' games that makes them so appealing to adults? What's the difference? No really, what's the difference? Cribbage uses a board, but we call that a card game. Monopoly and Risk have cards, but we call them board games. So what really makes card games different from board games, and which kind is more fun to play?